Graph is courtesy of x-rates.com. Just look at that nosedive the Euro has taken against the dollar! Woohoo for us! With any luck it'll keep on dropping and stay low all summer so we can afford just a few more pitchers of sangria on the Costa del Sol. 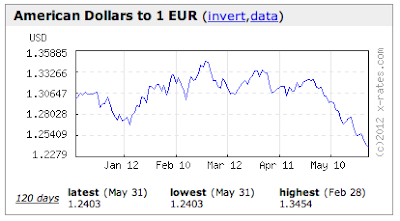 They say it may drop as much as 1.20 and even 1.10 in a year or so if the Euro leaders don't figure out what to do about their issues. Good for travellers, not so good for Europeans. Here's to further nosediving and sangrias!